Physiotherapists can effectively assess and treat rib injuries from the acute presentation through to chronic rib lesions. Acute rib injuries are usually traumatic and occur most commonly as a result of a sporting incident. However, rib injuries may also be of insidious onset and gradually get worse without any specific incident of note. With an acute rib injury, the patient usually presents experiencing sharp fairly localized pain with deep breathing and coughing. Pain may be felt at the costovertebral joints in the middle back, the sternocostal joints at the front of the chest, or right through the chest wall. 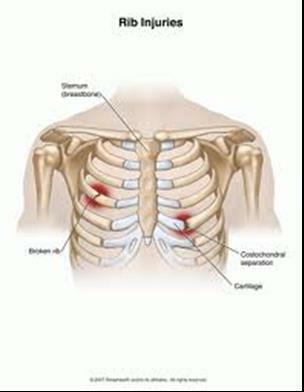 A rib fracture will be painful over the site of the injury, which is usually on the side of the chest wall. A localized acute inflammatory condition, chondritis, can also occur at the sternocostal joints at the front of the chest, particularly in females. Often there is palpable swelling and extreme tenderness over one or more joints. Chronic rib injuries can be the result of repetitious activities placing stress upon the costo-vertebral or costo-sternal joints over a period of time, eventually leading to pain and dysfunction. Treatment of rib injuries varies depending on the diagnosis and severity of the condition, and whether the condition is acute or chronic. Acute rib injuries respond well to ice and anti-inflammatories combined with physiotherapy treatment. Physiotherapy treatment involves mobilisations, contract/relax resisted muscle activity, and taping. Ice is usually the most relieving home treatment combined with gentle muscle and joint exercises as prescribed by the physiotherapist. Chronic rib injuries also respond very well to joint mobilisations or manipulations.